Because Justin is an only child, he doesn’t have playmates at home when he goes home from school. 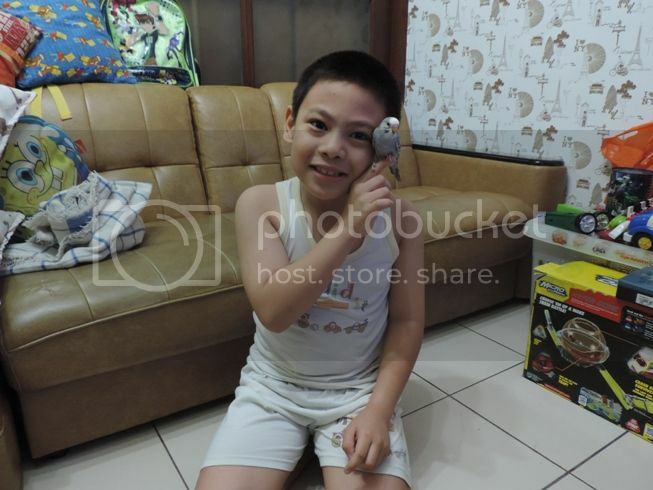 Before, our helper who stayed with us for three years was the appointed playmate of Justin after class, but since we haven’t had a helper for 6 months now, Justin wants to play with either me or his Dad or his favorite pet parakeet he named Ben. We have two parakeets at home, Ben and Angelica. Justin likes Ben more than Angelica because he is tamer than his cagemate. Whenever he feels like playing with Ben, Justin opens the bird cage, gently picks Ben up and places him on top of his head, shoulders, hands or feet. He also allows Ben to roam in our living room. My son finds joy in playing with Ben. He has one complaint, though. Ben poops a lot, and because he does, my son has to clean Ben’s droppings from the floor a lot of times. I guess he complains about it because that lessens his playtime with Ben. Lol! My sister in law used to have parakeet, they are cute birds! good thing he has a bird for a playmate. Hindi nya ba type to own a dog or a cat? Looks like your boy Justin loves his pets. Bit of advice, though (mommy-to-mommy), please be careful in handling bird poop. There is a risk of Psitacosis (pneumonia like disease caused by a bacteria in bird poop). Antibiotics treat the disease and it is not life threatening. Pets can give you more life and it is good for kids. I have pets at home though I am allergic with it I still consider because the love of my daughter.